The 10 Best Places for a Kid’s Birthday Party in Iowa! Birthdays only come around once a year, and if you’re a kid, that one day of the year is usually a special one. If you want to experience a birthday away from home, something memorable that matches the day, you don’t have to travel very far around Iowa to find an awesome venue. From inflatable playgrounds to amusement parks that provide all the fun, if you are looking to make some memories that soon won’t be forgotten, it would be worth your time to check out these 10 best places for a kid’s birthday party in Iowa! Featuring basketball bouncers, canyon crossings, and few giant slides, Pump It Up is the perfect place for your next kid’s birthday party arrangements. Filled with giant inflatable attractions, Pump It Up doesn’t only provide the perfect place to play, but with completely private parties at this fun establishment, you can have it all to yourself. This inflatable jungle is open to children taller than 32 inches, and the adults are encouraged to play along too. For a swinging, jumping, and general heart-pumping good time, Monkey Joe’s is a full-service inflatable playground that can burn off energy from even the most excited of children. Perfect for ages 12 and under, Monkey Joe’s offers all sorts of obstacles for kids to navigate in, through and around in a fun, clean and safe environment. 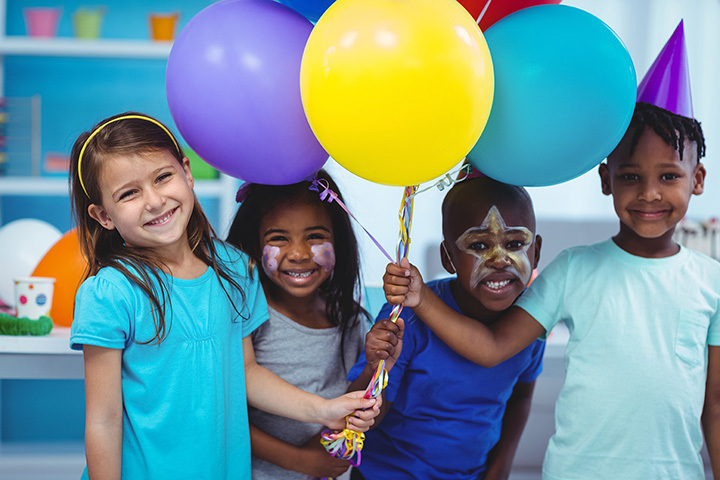 Birthday parties are a blast at Monkey Joe’s, and with the set-up helper and after-party cleaner that comes with all the private rooms, all the parents need to do is sit back and watch the kids have a good time. Discover science in action at the Science Center of Iowa in Des Moines. Not only a great place to explore for all ages, but the Science Center of Iowa hosts some of the best birthday parties you’ll find in the state. Included with private party reservations is entry into the many hands-on and experiential learning exhibits found throughout the facility. Private birthday parties also include an exclusive room to open the presents and blow out the candles. For a small extra charge, your birthday party can take on a certain theme, including the likes of dinosaurs, astronomy or crazy chemistry, ensuring for one birthday party the kids and the parents will never forget. Imagine being handed the keys to a playground manufactures showroom and told to have fun. Well, imagine no further, because that is exactly what Rainbow Play Systems of Iowa does throughout the year. While there is supervision and oversight involved, if you book a birthday party at Rainbow Play Systems of Iowa, you get two full hours of exclusive use for their playground showroom and party room. With enough slides, swings and stairs to climb to wear anyone out, your next birthday party at Rainbow will be one to remember. Take to the air at Sky Zone Trampoline Park and give all future birthday parties lofty expectations. Like every child’s dream come true, Sky Zone Trampoline Park features wall-to-wall trampolines and various obstacles to contend with, including an ultimate dodgeball arena. The birthday party packages vary at Sky Zone, with all providing jump time for party goers, and some providing all the food, beverages and party favors. Even the most energetic children don’t stand a chance from being worn out in a facility covered in trampolines, and everyone who attends will find a new bounce in their step. Not only does Synergy Gymnastics have a whole set of tumbling equipment, parachute games and padded floor space to begin with, but when you book a private party, your experience comes with an inflatable play set. Each private party reservation at Synergy Gymnastics comes with a trained birthday party leader to help keep an eye on everything as kids explore the gymnastics floor, and with the total one hour your party gets the floor space to themselves, you can bet the tired kiddos will be ready for some cake and ice cream. There’s always something memorable about roller skating rink birthday parties, and maybe it’s the smell of the brake-marked track combined with shoe disinfectant, or it’s the fast wheeling fun to be had cruising around the corners, but you just can’t beat the roller skating experience. All that fun and more can easily be found at Super Skate in Cedar Rapids, and with optional birthday packages available to anyone looking to celebrate a special day, you can leave the party up to the good people at Super Skate. Featuring an elaborate concoction of tunnels, bridges, pits, stairs and slides, the Playstation is one of the best playgrounds your kids will ever witness. Hours of fun can be found throughout the lengthy maze of playground equipment at the Playstation, and that doesn’t even include the additional “new” arcade and Lazer Maze also found in the facility. There are a variety of birthday packages available at the Playstation, including basic entry into the area for a group of kids and a whole set up of pizza, pop and ice cream. Slide on over to Lost Island to celebrate a special summer birthday, and experience one of the best waterparks in the Midwest. Featuring uniquely named wave pools, lazy rivers and more waterslides you could list in one article, Lost Island is a key summer destination in Iowa. Booking a private birthday party at this water-infused establishment gets party-goers a discounted admission price and access to a private pavilion to enjoy the time between the waterslides. Found on the western shore of the scenic Lake Okoboji, Arnolds Park Amusement Park has been delivering the big thrills for over 100 years, and in all that time, they have nearly perfected the birthday party experience. Booking a private party at this state-favorite amusement park allows for a group discount, and between the many roller coasters, Ferris wheels and food vendors, no second will be wasted not having a good time. For the thrill seekers among your party goers, The Legend Roller Coaster will surely deliver the excitement.